Killer Sudoku is a mix of Sudoku and Kakuro. 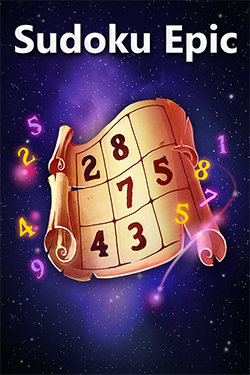 Your goal is the same as in regular sudoku: fill every row, column and 3x3 region with the numbers 1-9 once. The difference is how you arrive at those numbers. 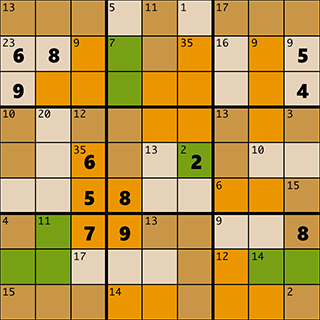 In killer sudoku, no numbers will be filled in at the start. An in addition to the rows, columns and 3x3 regions, every cell is also a part of a cage, indicated by different colors. Each of these cages has a sum, and you must work out what numbers to put in each cell based on the sum of the cage. Each cell in a cage is added up and must match the sum of that cage. An unsolved killer sudoku puzzle. Note the color cages, and the sum for each cage. 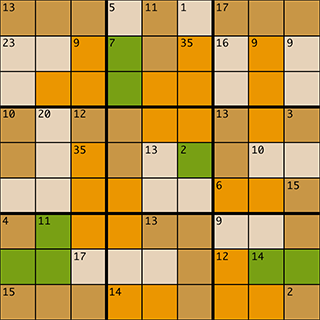 Fill all rows, columns and 3x3 region with numbers exactly like in regular sudoku. Every cell is a part of a cage, indicated by colors. Make sure the cells can be added up to the sum of its cage. Numbers cannot repeat within cages. Numbers cannot repeat within a single row, column or 3x3 region. A partially solved puzzle. Note the sums adding up: (6+8+9 = 23), (5+4 = 9), (6+5+8+7+9 = 35), (2 = 2). 1. First try to find cages with only one cell. In the above puzzle, there are several of these e.g. the 2 already filled in. 2. Try to find cages with very low or very high sums. The more extreme (high or low) a sum is, the fewer possible combinations of numbers there will be. 3. A very useful tip is that the sum of all numbers in a house (a "house" is any row, column or 3x3 region) is always 45. This means that if one or more cages are contained fully within the same house, then the sum of the remaining cells can be deduced. E.g: Look at the lower right 3x3 region in the above puzzle. It contains four complete cages with sums of 9, 12, 14 and 2. The last cell must then contain (45 - (9+12+14+2) = 8). 4. When applying the above rule to rows, columns or regions, also remember that you can extend it to cover two or three complete regions, with sums totaling 90 or 135 etc. 5. If you play killer sudoku puzzles in Sudoku Epic, you can tap/click and hold for 1 second on a cell to bring up a list of possible combinations for that cage. In addition, you can enable a setting to fill in notes at the start of the puzzle. This is especially helpful in Killer Sudoku puzzles.